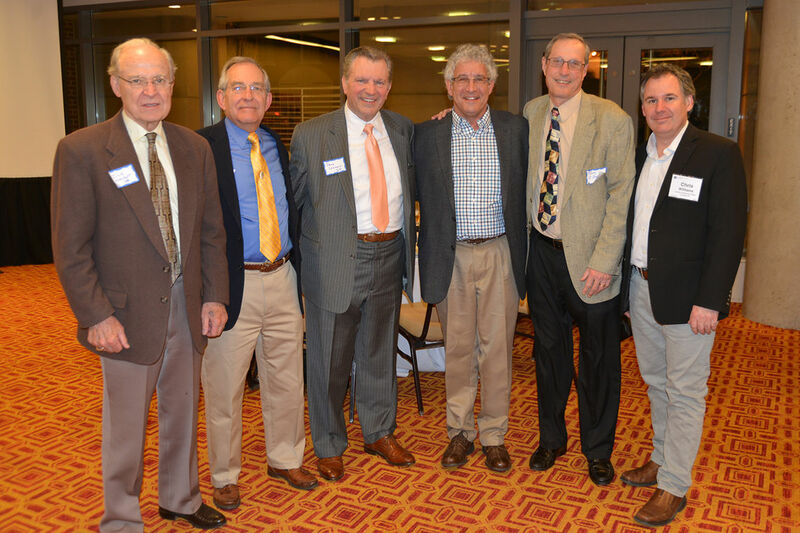 A $5 million gift from prominent geologist David Lehman, a 1968 alumnus, will endow Franklin & Marshall College's standout, NCAA Division I wrestling program for generations of student-athletes to come. The gift establishing the "David H. Lehman Endowed Wrestling Program Fund" will fully endow wrestling program operations, including funding for existing personnel, equipment, competitions, and ongoing recruitment of student-athletes. The College hosts one of only 11 Division I wrestling programs at liberal arts colleges -- including military academies -- nationwide, and last year sent an "All-American" wrestler to the NCAA Championships. Lehman, the president and CEO of Denver-based DJ Resources, was on the wrestling team for all four of his years at F&M. A current trustee of the College, he also has long shown a commitment to supporting F&M's academic strength through building partnerships between the geosciences program and industry. 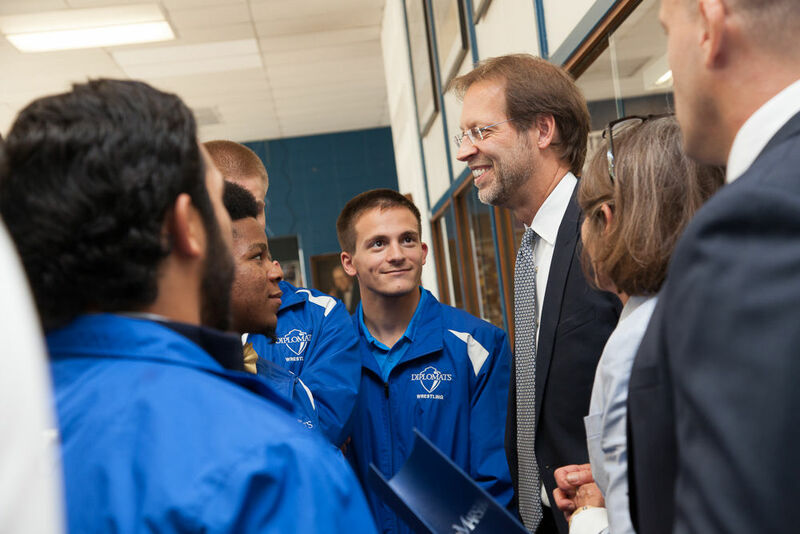 College President Daniel R. Porterfield said Lehman's ongoing contributions inspire pride in the legacy of the student-athlete experience at F&M. "Dave Lehman's generous gift will play a vital role in cultivating the values of leadership, service, teamwork and integrity that are at the core of our mission in the athletics program," Porterfield said. "Franklin & Marshall is proud to have an alumnus of the College demonstrate such pride and dedication to sustaining the educational values that have created a tradition of excellence throughout the history of F&M wrestling and all athletics at F&M." 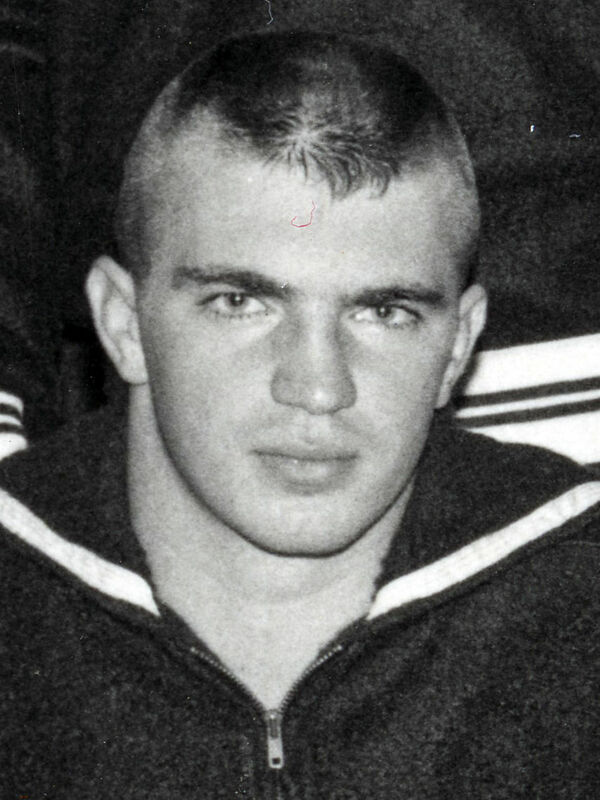 The College's wrestling program has long been influential in the national wrestling community, counting among its graduates many prominent collegiate leaders in athletics, including the coach leading the wrestling program at Harvard University and the director of athletics at Cornell University. The endowment created by the Lehman Fund will provide, in perpetuity, annual support designed to sustain and enhance the wrestling program and its national prominence. Lehman said this is important for any higher education institution in an era of increased overall competitiveness for academically talented students. "The College has a long tradition of having an excellent wrestling program, competing against schools like Columbia, Temple, Bucknell, Penn …,"said Lehman, who wrestled against these schools on an undefeated freshman team as a student. "I've always been proud that F&M Wrestling competes in Division I, and so it's not like bringing excellence in wrestling to F&M is anything new. But sustaining some distinctive things that we do well on a national scale is just great for the College." F&M's nearly century-old wrestling team has competed in Division I since the divisions were established in the early 1970s, and the wrestling program is part of the Eastern Intercollegiate Wrestling Association. The College competes in the NCAA Division III Centennial Conference for most sports. "In honor of Dave Lehman's gift, the College plans to rename the popular F&M Open wrestling tournament that annually attracts nearly 400 collegiate wrestlers from nationally prominent wrestling programs," Porterfield said. The F&M Open's participants have included Princeton, American, Bucknell and Drexel universities, as well as the U.S. Army and Navy academies. The new name will be the David H. Lehman F&M Open. Coinciding with the Lehman F&M Open, the College plans to host annual dinners featuring a prominent speaker. The dinners are intended to enhance connections between the F&M wrestling program and the broader high school and college wrestling communities. Head Wrestling Coach Mike Rogers said the Lehman Fund likely puts Franklin & Marshall Wrestling in a small class of programs that are endowed. "This comes at a time when a lot of programs across the country are struggling, but F&M's program is thriving and doing very well." Rogers said that sends a positive message, not only to the national wrestling community, but also to the College's students. "When someone invests in an endowment, it motivates our students to want to perform," Rogers said. "Our students are going to go out there and wrestle with a little bit more sense of pride. They want to represent F&M and bring the program to another level." The gift sends a powerful message to all of the College's student-athletes, said Patricia Epps, F&M's director of athletics and recreation. "It challenges them, moving forward, to not only reach their potential in their sports, but also to reach their potential in life, both professionally, and as upstanding human beings, because Dave Lehman is such a great example," Epps said. "Hearing the story of what motivated his amazing gift shows the tremendous impact that a place like F&M can have on a young person's life." Says Lehman: Attending F&M like "winning the lottery"
Raised on a farm in Pennsylvania's southern Lancaster County, Lehman found his way to F&M from rural Solanco High School after his high school wrestling coach set up a meeting on campus with F&M's Coach Roy Phillips, a 1934 alumnus and F&M's head wrestling coach from 1949 to 1967. Lehman's high school coach had wrestled for Phillips. "I could not have imagined starting on a better course for my career and my life than how I started at F&M," Lehman said. "There were so many opportunities that my education opened up for me. I really can't put in monetary terms what that's worth." Neither of Lehman's parents had attended college, and when he began his first year at F&M in 1964, he felt like he had "won the lottery." "I was encouraged to take a geology course, and I found my profession," Lehman said. "And then on the freshman wrestling team, it was the greatest camaraderie on any team I had ever seen, so I just loved the student-athlete experience." Lehman graduated with a degree in geology from the department now called Earth and Environment at F&M, and after graduation served as a non-commissioned Army officer in Vietnam. Later, after earning a Ph.D. in geology from the University of Texas at Austin, he was a geologist for ExxonMobil for 28 years, and ultimately founded several companies focused on oil and gas exploration and development. But he never forgot Franklin & Marshall, including hiring bright graduates. In his current nine-person company, five employees, including Lehman, are F&M alumni. "When I came to F&M, that showed me a whole new world," Lehman said. "I've had a great career and I've had some wonderful experiences, and when I think of F&M, it's about finding ways to make an impact." Lehman in 2002 co-founded the Geosciences Founders Society to build partnerships with alumni and friends in the geosciences field to support student field study and faculty research in the Department of Earth and Environment. Carol de Wet, the Dr. E. Paul & Frances H. Reiff Professor of Geosciences at Franklin & Marshall, said Lehman's long-term dedication to the academic mission of the College has been "transformative." "His example has prompted many alumni to engage with the department in meaningful new ways: by joining the Founders Society, contributing financially, sponsoring field research experiences, and sharing their expertise with our students," de Wet said. "Dave's energy, enthusiasm and unwavering support have moved the department forward in ways we could barely have imagined 12 years ago." After handing over the reins of the Geosciences Founders Society in 2013, Lehman turned his attention to F&M wrestling. Lehman, who maintains residences in Houston and Denver with his wife of 35 years, Patsy -- and whose daughter, Lisa Lehman, graduated from F&M in 2001 and brother, Roy Lehman II, M.D., in 1969 -- remains a frequent visitor to campus. He said he will continue attending wrestling matches as a fan of the team while serving the College in other ways. 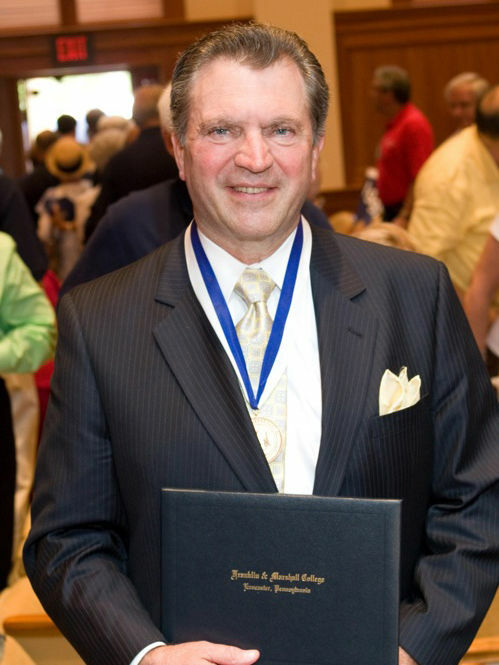 Among his many volunteer contributions to F&M, Lehman earned the Alumni Medal for service to the College; was a founding member of the Diplomat Athletic Club athletic volunteers organization; and was appointed to the Board of Trustees in July 2013, serving on the enrollment, student life and technology committees. "When you get the sort of payoff from attending F&M that I did," Lehman said, "I like to think, how do you pay that back?" Dave Lehman '68 is recognized by Franklin & Marshall College Chair of Environmental Science Chris Williams among the current and past officers of the Geosciences Founders Society that Lehman was instrumental in establishing in 2002 (from left to right: Richard E. Wright '58, Lane D. Schultz '66, P'96, Lehman, Robert H. Marion '73, Thomas H. O'Donnell '72, Williams).